A slipped tendon is most common in fast growing hybrid meat chicks although it can affect pure breeds from time to time. Using out of date chick crumbs is the most common cause since the Vitamin B content is low in out of date food. As can be seen in the photo, the leg is held out and twisted. In severe cases, the chick will not be able to eat or drink and is better off being dispatched. 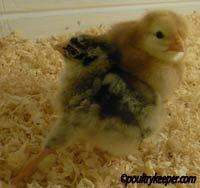 Symptoms: In chicks and young growers: Week old chicks and growers get swollen hock joint and will usually hop but sometimes one or both legs twist to the side. Causes: Lack of manganese or Vitamin B and genetics. Diagnosis: Symptoms above, post mortem, analysis of feed. Prevention: Use fresh chick crumbs (in date). Vitamin supplements in the water, genetic selection, avoid over crowding. Treatment: Vitamin B and manganese supplement to reduce the damage (but will not reverse the problem once it has occurred).